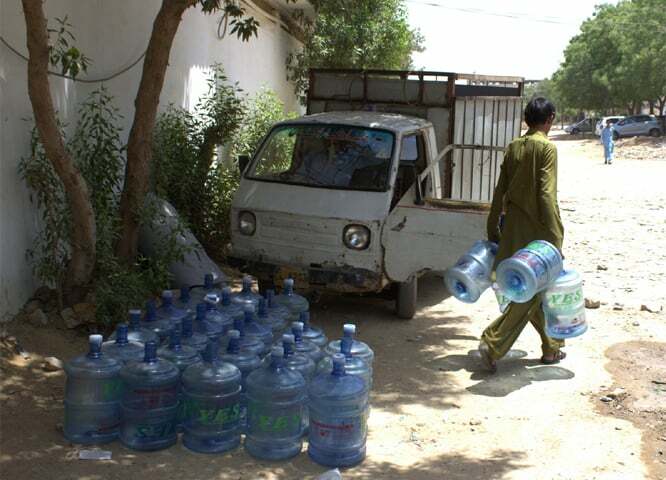 An estimated 15-20pc of Pakistanis use bottled water because of fears of unsafe drinking water supplied in the system. Rizwanullah Khan carries two steel katoris [bowls]; one that he purchased from Jodia Bazaar and the other that can hold both cold and hot beverages. The latter has the Quranic Ayat-e-Shifa [Verse of Healing] inscribed on it. It’s the second one he uses to drink water from when he’s on the go. Since his primary mode of transport is a bicycle, he needs to get rehydrated often. And while he may drink water from any source, he says, his children carry water bottles around that are filled with boiled water from home. “We boil, strain and store the water for drinking purposes in a matka [earthenware pitcher].” This water is supplied to their home in the upscale Defence Housing Authority locality through tankers. For Khan and his wife, though, health is not a primary concern. Living according to certain values that are a mix of “hippie/green and Sufi” that he and his sister imbibed from their parents, and which have now rubbed on to his wife too, theirs is a battle against anything that smells remotely of “corporatocracy.” And in particular, against companies that have “commodified” water, selling it by “running aquifers dry” or “buying lakes in Africa”, for example. To the urbanised, consumerist and upwardly mobile bottled-water fed generation, people such as Khan are an anomaly and his lifestyle cumbersome, tedious, even strange. “I don’t think I am courageous enough to take my chance with drinking tap water from any city in Pakistan, especially not in Karachi!” says Salman Ahmed, a young entrepreneur. And that may be the response one would get from a majority of the people residing in most urban centres in Pakistan, not just Karachi, which according to reports, is supplied the most contaminated potable water. Last year, over 83 percent of water in 14 of the 29 districts in Sindh was unsafe for drinking with Karachi scoring the highest in contamination at nearly 91 percent. The June 2018 Pakistan Council of Research for Water Resources (PCRWR) report attributed 45 percent of infant deaths in Pakistan to diarrhoea and about 60 percent to overall infectious waterborne diseases in Pakistan. But turning to the bottle because of health fears is not just found in Pakistan alone; globally more and more people are consuming water from the bottle, even where governments say tap water is safe. Today it’s the fastest-growing beverage market in the world, valued at US$147 billion per year. One would think bottled water is a fad with the rich but that notion does not hold in reality. 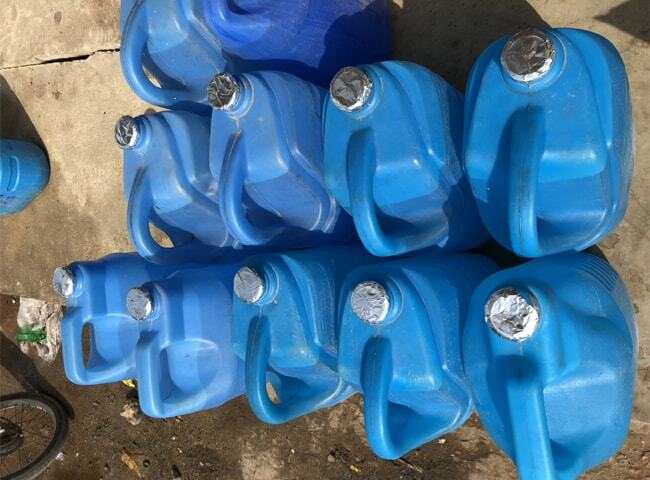 The fear of waterborne disease is so widespread in a city as mammoth as Karachi that even those living in katchi abadis [squatter settlements] buy the un-branded blue plastic barrels from their nearby neighbourhood grocery stores, thinking it’s cleaner than that supplied from the municipality or private tankers. Consider the case of 20-something Aasia Kamran, a young mother who works as domestic help. Living in Shirin Jinnah Colony, near Karachi’s Clifton area, Kamran has never given her two-year-old son water from the 19-litre blue plastic barrel. “I only use the 1.5-litre branded bottle, she says, “because the doctor told me very strictly never to give him any other or he will fall very sick!”. Their use of water is very judicious, in part due to the costs involved. This differentiation is for potable water needs; the rest of their needs, including tea and for cooking (because they boil it), are met with water from tankers. But the water that Kamran buys comes from groundwater and costs the company next to nothing. What she is paying for is actually the cost of drawing water from the source, the raw material used in the manufacture of the plastic bottle, energy used in treatment of water, energy used in cleaning, filling, labelling, refrigerating and, marketing, and transportation cost to retailers and then to the consumer. A source from the water and beverage industry, on condition of anonymity, tells Eos: “On average, the production cost is about 30 percent. Trade discounts, selling and distribution expenses are 29 percent. Retailer and distribution margin is 15 percent.” In addition, Kamran probably pays the 17 percent tax imposed by the government on the company as well as the five to six percent profit the company is likely making off selling water. But, argue various companies, just because there is no fee for the abstraction of water, it does not mean that water comes to them completely free. Many researchers point to the high water footprint (packaging, treatment, bottling, sanitisation) of the industry. According to one by FreshWaterWatch, plastic bottles need three times the water that they can actually hold. This means that three litre of water is needed to make a water bottle that only holds one litre! Families such as Kamran’s, despite paying dearly, might not be getting safe water to begin with. Ghulam Murtaza, a research officer at the Karachi office of the Pakistan Council of Research for Water Resources (PCRWR), has been monitoring water quality – surface, ground and bottled water for over a decade now and is not duped by the unsullied appearance of the bottled water available around Karachi. The council carries out quarterly laboratory tests of water from different sources which they share with the Ministry of Science and Technology. For the bottled water, in particular, the ministry directs the Pakistan Standards and Quality Control Authority (PSQCA), working under it (and which gives licenses to bottling plants to sell their products after they meet certain standards), to seal those companies found not complying. Ali Bux Soomro, project director of the Conformity Assessment Centre (CAC) of the south zone of the PQSCA, an organisation that provides product certification and inspection services in Sindh and Balochistan, tells Eos that in the two provinces under his watch, there are some 250 licensed brands available in the market. However, hundreds of unregistered brands are being sold in the market. “It is illegal to operate a bottled water company without a PQSCA licence,” says Soomro, adding that the government inspectors often raid set-ups and seal them. “But these companies quickly take on a new identity at a new location and carry on with unauthorized bottling of water,” he says. 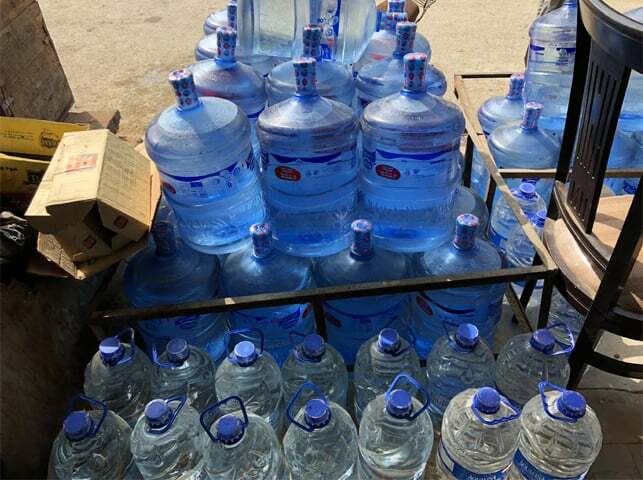 Many unregistered bottling companies have been found to simply fill the blue plastic barrels with water supplied for domestic consumption by services, such as WASA in Lahore or KWSB in Karachi, and sell it at prices slightly lower than the registered ones. Others use underground water and pass it through reverse osmosis (RO) plants, and mark up the price a little more. Murtaza of the PCRWR, who is also the member of the taskforce set up by the judicial commission on water and sanitation (which was set up by the Supreme Court last year) tells Eos that two months ago the commission had directed the council to conduct tests on water samples collected from public hospitals and schools across Sindh. 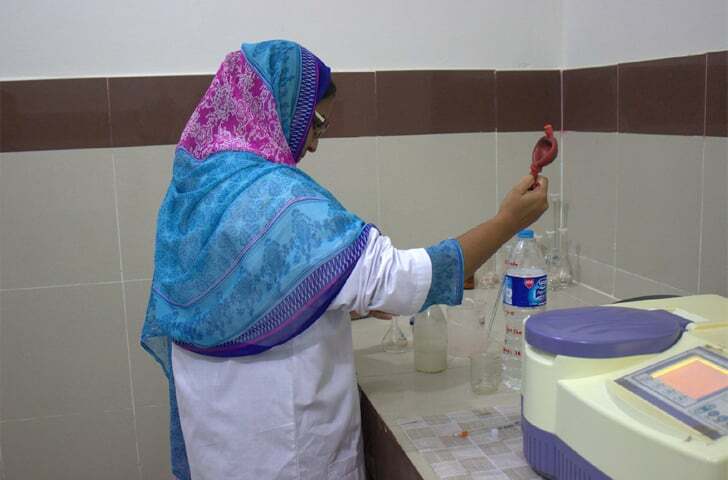 “We found that 85.2 percent of the 250 water samples collected at public hospitals, in 22 districts of the province, including Karachi, had physicochemical or microbiological contaminants,” he says. These samples included water from bottles, dispensers as well as other sources. Irked about even bottled drinking water being contaminated, the commission directed the PSQCA, last month, to run another set of tests solely on the bottled water. In addition, it ordered the health department to cancel the contracts with companies supplying water to hospitals if they were not registered with the PSQCA, irrespective of the quality of the water. The naming and shaming of the companies selling contaminated water by media continues but this has done little to disrupt the sale of bottled water. “Our archaic water supply system has lost public trust. Despite being declared unfit for use, people continue to repose more trust in bottling companies over the government’s water supply schemes,” points out Sohaib Waseem, senior officer of WWF-Pakistan’s Freshwater Programme. Waseem argues that the government needs to use the conviction of science and technology to prove that their systems hold merit to supply safe drinking water to its citizens. “Until then, bottling water companies will continue to fill in the void created due to faulty government water supply systems,” he says. In addition, he believes that consumers equate clean drinking water (when impurities are not visible) to safe drinking water (fit for human consumption). “When they see clean, bottled water, it is assumed that is possibly better for human consumption than the local supply,” says Waseem, adding it was often more convenient than filtering or boiling the water. While residents are clamouring for water and complaining of it paucity, it seems bottling companies have an endless supply to fill up their bottles and that too almost for free. “There is no limit to how much the companies can extract,” says WWF’s Waseem. Happily for anyone extracting groundwater, it remains unregulated in Pakistan. “Unfortunately Pakistan does not have any law specific to groundwater abstraction,” explains the WWF spokesperson, although he says references and sections pertaining to the “use of groundwater” are found in different laws and acts. The National Water Policy 2018, or the earlier Canal and Drainage Act 1873, the Provincial Irrigation and Drainage Authority Act 1997 or the Punjab Soil Reclamation Act 1952 have “scarce” mentions with words like “groundwater”, “sub-soil” or “underground resources”. Last year the Punjab government’s Irrigation Department had drafted the Punjab Groundwater Protection, Regulation, and Development Act (2017) to regulate groundwater extraction across Punjab province and had even started consulting with various stakeholders. When it will get a shot in the arm is anyone’s guess. That said, not only is there no limit to how much the bottling companies can extract, they also do not pay for what they pump out. Instead, they pay a fixed monthly “commercial rate” based on the size of land prescribed under provincial development laws like the Punjab Development of Cities (Amendment) Act 2014, in case of Punjab, explained WWF’s Waseem. The IWMI spokesperson emphasises it is time Pakistan moved towards charging all sectors for water, including farmers, municipalities as well as the industrial sector. The bottling companies say they would be happy to pay their due share if other users do too. Most of the factories which sell bottled water are spread across Punjab, Sindh and portions of the Khyber Pakhtunkhwa and Balochistan as well. The larger factories are in Punjab and Sindh while smaller ones exist in Khyber Pakhtunkhwa and Balochistan. All bottling companies in Pakistan rely on groundwater extraction for sourcing their water and use RO treatment along with adding a dosage of minerals. The environmental impact of bottling water as well as over-exploitation of groundwater for any purpose can be of significance, argue water activists, especially when water that is pumped is in excess of what is replenished. A NASA-led study of 37 of the world’s largest aquifers of the world between 2003 and 2013, found the Indus Basin aquifer to be the second-most overstressed, which was being depleted without getting recharged. It becomes of consequence if a bottling industry (or any other industry) is drawing groundwater adjacent to small farmers with modest shallow wells and there the groundwater starts to fall. “That is where you do have impact upon the small farmer,” points out Anwar. And, says the WWF spokesperson, if the groundwater is not able to recharge at the same rate as it is exploited, eventually it is going to have a negative impact on the local environment. “The drying up of the Katas Raj pond due to over-abstraction of groundwater by local cement factories is a visually explicit example of such consequences,” he says. However, to be fair to bottling companies, some of the “more conscious” ones have static water level meters installed with their pumps that continuously monitor levels of their underground aquifer. But Waseem argues that while these measurements do provide “a good entry point to assess the situation of groundwater” and need to be promoted, this factor, alone, was not enough. WWF-Pakistan, he says, had been voicing for water replenishment in this regard. “Due to over-extraction, certain elements which were untraceable before, may become detectable due to increase in their concentrations” says Waseem giving the example of arsenic, for instance. A research published in Science Advances last year, based on data from nearly 1,200 groundwater samples says “very high concentrations” of arsenic were found from across Pakistan with over 200 micrograms/litre found mainly in south. It further says that up to 60 million people were at risk of arsenic poisoning. Regular consumption of water containing high concentrations of arsenic leads to skin disorders, lung cancer, and cardiovascular diseases, say health experts. The World Health Organisation has established a level of 10 micrograms per litre as permissible concentration in drinking water, although the Pakistan government finds up to 50 micrograms per litre to be acceptable. It’s not just what’s in the plastic bottle that is under endless discussion these days, but the container itself is getting bad rap. Environmentalists around the globe are urging people to stop their plastic binge. It is causing more harm to the earth and the oceans than even climate change, they fear. A lot of the plastic on our earth has to do with our unsatiated thirst for bottled water. 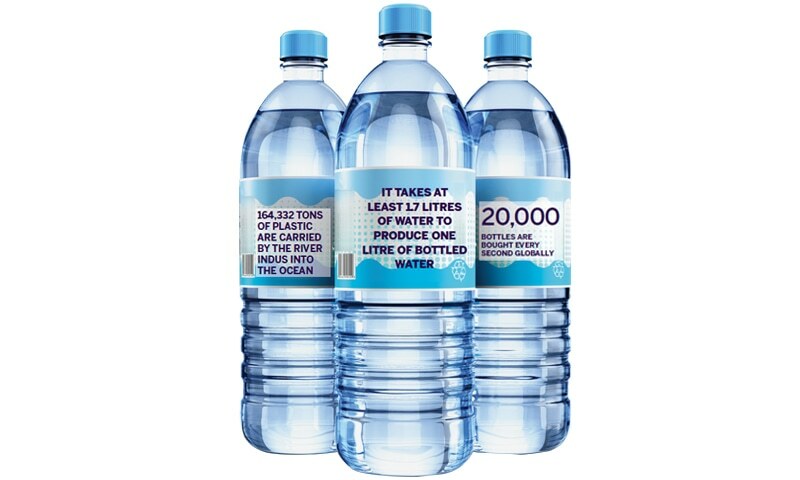 Nearly 20,000 bottles are bought every second and this number will only jump to another 20 percent by 2021. More than 480bn plastic drinking bottles were sold in 2016 across the world, up from about 300bn a decade ago. By 2021, this will increase to over 583bn according to leading independent provider of strategic market research Euromonitor International’s global packaging trends report. There are no exact figures to show how many plastic bottles are sold in Pakistan but WWF-Pakistan’s Waseem says roughly 15-20 percent of population, that too in urban areas, use bottled water. Citing a study, Waseem says that Indus river carries an estimated 164,332 tons of plastic into oceans. It was ranked number two among the ten rivers which carry more than 90 percent of the plastic waste that ends up in the oceans. Of course, not all plastic is plastic water bottles. The plastic used for bottling soft drinks and water are made from polyethylene terephthalate (Pet), a recyclable material from which new bottles can be made, but it isn’t. A fraction of PET is recycled and the “yarn” used in clothes, carpet, toys, and packaging materials. “Conventional plastic bottles can greatly choke sewers, increase stress on landfill sites, pollute oceans and rivers and cause harm to life under water and on land,” says Waseem, adding: “Proper recycling or reuse of such plastic is vital.” Sadly the recycling efforts have failed to keep pace with the huge number of bottles that is churned and discarded. But plastic is not just harming the earth and the oceans, it is fast finding its way into the human food chain. Early this year, Orb Media, a non-profit journalism organization based in Washington, D.C found microplastics in bottled water. Last year they had found plastic particles in samples of tap water and in seafood among others. In the West, discussion has now moved to encouraging people to turn to tap water, installing water fountains at public places and refilling their bottles, with bottle to be used only when necessary since water supplied through the tap is safe for drinking. In Pakistan, given the water quality from the tap, people are not yet ready, but there are some initial efforts made at some people are making some effort. “At my office, we really discourage water bottles. Even at meetings, we provide glasses so people can fill/refill the water available at the dispenser,” says Hina Lotia, director programmes at Islamabad based Leadership for Environment and Development (LEAD) Pakistan. At the British High Commission in Islamabad, the staff is encouraged to use recyclable bottles or use glasses to fill the water in. It is part of the “Foreign and Commonwealth Office’s effort to ban avoidable single-use plastics from its estate by 2020,” says Samuel Heath, heading the communications section at the BHC. 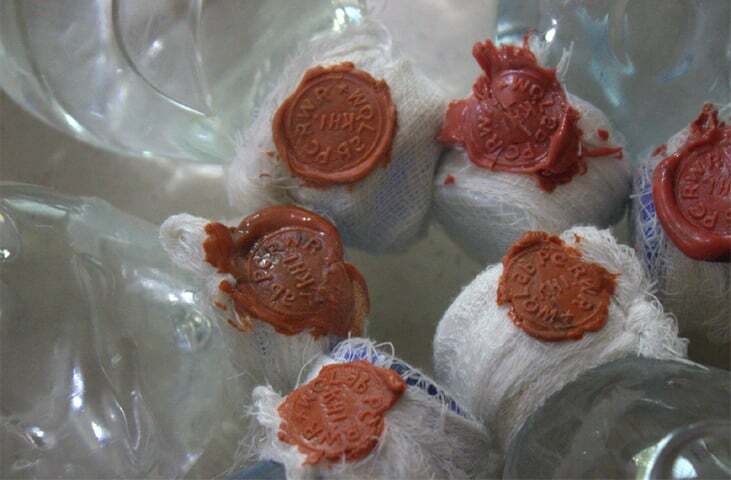 “The ban includes our headquarters in London and our nearly 270 diplomatic posts, including Islamabad and Karachi.” The FCO has already removed plastic straws, plastic bags and plastic cutlery and introduced reusable coffee cups, water bottles and straws. In their own small way, two educational institutes in Karachi — the Habib University (HU) and the Institute of Business Management (IoBM) — are doing their bit in minimising the use of plastic water bottles. The HU has provided customised water bottles to all students, faculty and staff so that they can refill water for free from conveniently placed dispensers from a licensed bottling company all across its campus. The days of expensive bottled water may well be numbered if the new start-up, by the name of PakVitae Solutions (PVS), has its way. Founded by a group of a mix of entrepreneurs and engineers, the youngsters claim to have invented a “low cost” technology to purify drinking water to 99.9999 percent, and that too without using electricity. “There will be no need for bottled water, no need for boiling either once you get our purifying technology installed to your taps,” Shayan Sohail, chief executive officer at PVS, tells Eos. But they admit, the technology they use is not new. “It was developed in the 1990s, but even now it is very expensive. We’ve managed to bring the cost down to an extent that it’s become affordable,” says Sohail who is a chemical engineer with specialization in polymeric membranes. They are competing directly with the bottled water industry, they emphasise. They have received certification from WASA, PCRWR, PCSIR and the University of Engineering and Technology, Lahore. The PVS spokesperson says the filter has a very long shelf life — a lifetime, according to him — while the cartridge needs to be replaced only once a year. “For a household of anywhere between five to six people who only use bottled water for drinking purposes, the cost is conservatively coming to 30,000 rupees annually year,” says Sohail, doing a quick back-of-the-envelope calculation. “If they install the PakVitae, the cost would be just 5,000 rupees or at most 8,000 rupees per year. Refining the design of the filter for home use, the spokesperson promised not only will it be “user-friendly” but “stylish”! And including the filters connected to taps, the PVS has been working on filters for hand pumps, sweet water wells and water wheelies as well as filters for rural homes. It is currently catering to a handful of NGOs, the Pakistan Army, some educational and health institutes and micro-entrepreneurs, but many more are interested. Last year, the start-up was honoured by the government with the most Innovative Technology award. What’s even more heartening, PVS has made its presence felt internationally as well, especially at several international tech platforms including Hello Tomorrow, Falling Walls, and Young Water Solutions. The bottle scam is clear proof of failure of government management in executing and maintenance of water supply schemes. People are made to pay one hundred times more for unsafe water. There is plenty of water but not good management. Spending billions of ruppes on water bottles and helping Water tanker mafia is not long term solution. Gov should install a water meter at every house and build water and severage lines. So consumer can pay how much water usage. And connect those lines with big water recycling and filtration plants. Severage wastege use for agriculture production or generate electricity. These kinds of reforms only possible if Public demand from politicians otherwise People should stop blaming water crisis and pay extra to buy water bottles and filling bank balance of water mafia. Why not Government itself develop a system of extraction of drinkable water and supply it to the public? Why private companies and the local water suppliers are even allowed to extract from water resources that should have been under Government control. Definitely the corrupt in the Government and local authorities are benefiting from this mafia and earning their share through commisions and who knows they even own all this. Water mafia will be our undoing. Let this be a test case that Hub Canal Khi has a politically connected tanker mafia. When Faisal Vawda threatened consequences; poor clueless Fishermen Sindhis were motivated to long march against gov. Thjs motivation came from Khursheed Shah and PPP assets who are openly against Dams and accountability. the situation is sad, its the govt's duty to provide safe drinking water. Since 2-3 years, here in Bangalore and other cities in our state there are govt installed RO dispensers, the network well spread and its available every 2-3 kms. these are huge RO filters and it takes up a 10'x10' feet room. each location has borewell from which water is pumped to overhead tank. in our layout, and in many places the unused waste water is used to water the park around the dispenser. it is charged at Rs. 5 per 20Ltrs. The quality is excellent and the rs.5 charge goes to it maintenance. lot of people use it. Earlier it used to be the same situation as you people are, the clean drinking water is controlled by water tanker mafia including the politician.. It's too much lengthy with out any conclusion. Good informative article. The small bottles of 1L or less are normally OK. The problem is in large pack of 10L or 19L, which are reused, without a proper sterilization. Often the water found stinky & smell in large packs. The water companies must improve their sterilization process to high standards, and keep RO well maintained,add standard minerals, otherwise it’s OK. I too drink from anywhere and say Bismillah - it’s the most scientifically proven method of purification. Never fails. Remember plastic containers are carcinogenic. Proven now. Government must allow private RO plant to work anywhere in Pakistan and fixed reasonable rate after negotiation.Please ask Aga Khan hospital/ Shaukat Khanum Hospital/ Indus Hospital/Taba Hospital and similar hospital to monitor these RO plants.No government involvement.Atleast 30% less diseases less load on Hospitals. Cheapest way to kill the bacteria and viruses in water is the fill clear plastic bottles with it and leave it flat on the side in hot sunshine for at least 6 hours and then refrigerate it. The sunshine will kill the germs. The cooled water should be consumed within 24 hours. Also if there visible particles in the water (like sand) the water should be filtered with a fine cloth first. I saw this in a science program on TV and this method is being used in Africa. Bottled water has to be one of the best scams that any company has managed to pull off. Water is free as they are mining it most of the time, depleting the water tables, we are just paying for the cost of the bottle, add that to not enough safety and quality checks, its a fire sale !!! How about around 1.2 million tube wells in Punjab and countless others in Balochistan running 24 hours for agriculture?